A baby is born with a functioning brain. All parts of the brain are present and working correctly, but that does not mean that a baby’s brain is exactly the same as ours. 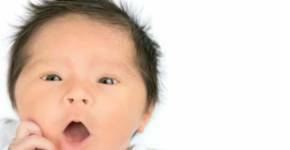 In this article you can read about your baby’s brain development from 0-2 months. Imagine it this way: the brain is not actually one single thing, but it consists of various parts. All those parts must continually develop. And in every period during the first year of life there will be different parts undergoing exceptional developments. Here, we give you a glimpse into the major developments in your baby’s brain, based on a joint project by Boston University School of Medicine, Erikson Institute and Zero to Three (www.zerotothree.org). During this period of brain development (0-2 months), your baby makes their first mental leap: 5 weeks after the due date. It is particularly interesting to talk about the parts of the brain that deal with touching, crying, hearing and seeing. From birth, the part of the brain that registers and processes touch is already well developed. It has to be because this physical contact is essential to a good start in life. From birth, this part of the brain continues developing at a rapid pace. The brain only registers the actual physical touch, after all the brain itself it not being touched. You see that there are certain places on a newborn’s body where touch is felt so strongly that this physical contact is registered better by the brain than when other parts of the body are touched. The most sensitive areas are the areas around the mouth, the palms and the soles of the feet. So, these areas deserve special attention when you are caressing and cuddling your baby! But that is not to say that the rest of the skin does not perceive touch. Indeed, the skin is so extremely sensitive to touch that the slightest physical contact is registered by the brain and is thus felt! You can rightly say that touch is extremely important during these first months. Food is essential to survival, so it makes sense that this part of the brain is highly active. The role that types of food play in the speed the brain develops and to the weight of the brain is less well known however. Breastfeeding has a significant effect on how fast and well the cells produce myelin, a fatty substance covering the axons (the projections of nerve cells that conduct the electric impulses). At birth, there is not a great deal of myelin present, but by the time a child is three years old many of the axons are covered with myelin. The presence of myelin enables the neurons to record and transmit information better and faster than before. It all sounds a bit complicated, and it may be difficult for us to grasp, but your newborn baby’s brain understands this process all too well! Besides through non-verbal communication, the only way your baby can communicate is by crying. You cannot compare a baby’s crying to that of an older child or adult as a baby cries a lot sooner. This is in part due to the fact that this part of the brain is now very active. When registering all the things that feel even the slightest bit unpleasant your baby will start crying. This is simply because this part of the brain is so active now. But it does not mean that your baby is putting it on for attention. Quite the opposite! Even if we think the reasons a baby is crying are ‘small’ or ‘irrelevant’, these things are major issues for your baby. It is not for us to decide what is important for a baby and when they are ‘putting it on’. After all, our perceptive faculties are very different to those of a baby. Therefore, it is true to say: comfort your baby. When something feels unpleasant and your baby starts crying, always let them know that you are there for them. That feeling is the best way of giving a baby a feeling of safety and security. And those feelings of safety and security greatly contribute to the happiness your child will experience at an older age. In the past, people thought that babies could not see anything at all or only in black and white. We now know that is nonsense. A baby sees everything, but the brain cannot register it all yet! The eye muscles are also not properly developed yet either. 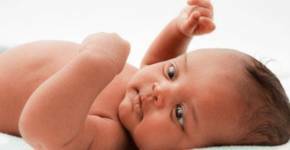 A newborn baby can focus best on a distance of 20-40 centimeters. The reason there is such a large margin (after all 40 centimeters is twice as far), is that sight develops at a rapid pace. We are now talking about the brain development during the first two months after birth, so over a period of eight weeks. In those eight weeks, the part of the brain that deals with sight undergoes extreme development. You will notice that your baby requires some time to focus and that their eyes jolt around. This is to do with the development of the eye muscles and the development of the brain. It is incredibly fun to see the world through the eyes of your baby, literally. They see a spotted cow against a background as one whole. They only notice the contrasts. They do not recognize that they are different objects! The brain still needs to learn that in the coming months. In the “The Wonder Weeks Online Guide” you can see animations that literally show you the world through a baby’s eyes. These will help you to understand your baby better! In the first two months, the part of the brain that deals with hearing is extremely active. Babies can already hear sounds in the womb during pregnancy. Research has shown that newborn babies even recognize daily sounds! Not only do they recognize the sound of their parents’ voices, and those of brothers and sisters, but also the dog’s bark and other loud noises that occur daily within family life. You can also see that a newborn has a preference for particular sounds. The brain is very interested in the sound of people talking and specifically in the voices of their parents, brothers and sisters, because they are already familiar with these voices. You can also really notice that a baby is busy registering sounds. If a baby hears something that interests them they will turn their eyes and head in the direction of that sound. Play with this, but give your baby time to turn their eyes and head. After all, a baby is not as quick at this as we are! Source: Zero to three, brain map.